Information about restoration efforts of the KiMo. 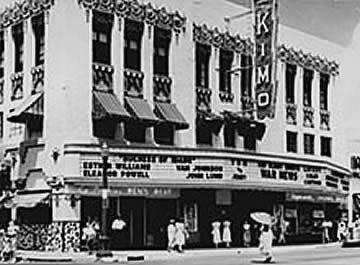 In 1977, Albuquerque voters approved a $324,000 bond to purchase the KiMo Theatre, listed on the National Register of Historic Places. After voters rejected a second bond to provide matching funds to a federal grant for the complete renovation of the theatre, the City of Albuquerque provided $1.1 million for a partial renovation. Architect Harvey Hoshour and his partner Dan Pearson led the first phase of the KiMo's renovation. The KiMo's trademark buffalo skulls were restored to their original colors. Mission light fixtures on the façade were replicated from old photographs. Door handles modeled after Kachinas were duplicated from the one remaining handle. The balcony railing in the lobby, composed of wrought iron bird figures, was 11 inches too short to meet modern safety codes. Harvey Hoshour devised a novel solution to retain the railings' original look. Additional metal was inserted in the birds' necks and legs to make the railing taller. The talented craftsman who performed the work was none other than the grandson of the man who created the original railing. Another phase of restoration, at a cost of $35,000, focused on the Carl Von Hassler murals. Friends of the KiMo raised about $10,000, with additional funding contributed by the Urban Enhancement Trust Fund and the Albuquerque Community Foundation. Anne Rosenthal, an art preservationist from the San Francisco Bay area, led the team who worked on the murals. Accompanying her was her husband Michael Wolfe, and Greg Thomas and Michael Dunn. After years of planning, a second major phase of renovation was begun in the spring of 1999. Completed in the summer of 2000, this most recent renovation cost approximately $2 million and was funded by a City of Albuquerque general obligation bond, lodgers' tax revenues, and One Percent for Art Program funds. The extensive restoration project was led by the architectural firm of Kells and Craig. The Konkright Center for Cultural Materials of Santa Fe was hired to restore original artwork throughout the facility. The original proscenium arch including elaborate Pueblo-Deco designs that had been destroyed in a 1960's fire was replicated. Plaster buffalo skulls, turtles, and other Native American symbols were copied from the originals and once again decorate the main proscenium arch. New stage lighting positions were created within other restored areas. The original grand drape was also replicated, and includes medallions and hand-painted details. The entire ceiling in the auditorium was carefully cleaned, repaired and restored. Conservationists worked for months atop scaffolding far above the auditorium floor to restore the spectacular "environmental" artwork. Vigas (roof beams) decorated with Pueblo Indian motifs seem to open onto a starry night sky. Chandeliers modeled after Native American funerary canoes hang above the audience. New acoustic wall treatments were applied in the auditorium. During the removal of the old acoustic materials, original artwork depicting Navajo Yei figures and sandpaintings was uncovered. Although the originals were too damaged to be repaired, the images were carefully photographed and replicated by art conservationists on the new acoustic wall fabric. New carpet and flooring were installed throughout the KiMo. When the old carpeting was removed from the lobby stairs and mezzanine, the original patterned tile was exposed. The tile was cleaned, repaired and restored to its original appearance. Two new restrooms were installed in the upper lobby in the same location as original restrooms. The KiMo's seating was entirely replaced to meet modern building and accessibility codes. The main floor of the auditorium was removed and reconfigured. Restored Pueblo Deco-style seats with custom features were designed to match the KiMo's distinctive architecture. The newly-renovated auditorium now seats 650, with handicapped-accessible seating throughout the main floor. Electrical upgrades, an enlarged control booth, and a new stage-level accessible dressing room were also part of the 1999-2000 renovation. A new stage ceiling, new rigging hardware, new stage draperies, and new lighting and sound equipment completed the work. Still to be renovated is the stage fly-loft, no longer usable as the result of a 1960's fire, and the older dressing rooms, including backstage plumbing and electrical upgrades. The KiMo's second floor business offices were renovated to meet current building and safety codes over the winter of 2000-2001. The third floor office area was renovated in 2002. Work included upgrading plumbing and electrical systems, a new telephone system and new roofing. Edited by John Arnold, New Mexico Museum of Natural History, with information provided by the KiMo Theatre.